Instead of writing the words ‘mercury’ and ‘moon’ (transcribed in square brackets here), Hooke depicted them with their astrological symbols ☿ and ☽ as a kind of shorthand. For me, the interesting thing about this entry is that Hooke’s own life seems inextricably linked with the weather – he inserts a comment about his cold in the middle of his very first weather report. I think this is a clue to interpreting the weather reports, and thinking about why they appear in what quickly becomes a very personal (and messy, subjective, ‘unscientific’) document and not, for example, in a separate log book (which is what he had advocated to the Royal Society in a paper in 1663). Hooke, and his colleagues in experimental philosophy, had very little way of knowing what information was going to be useful for their scientific endeavours; and they couldn’t predict what sorts of things might influence other things – the effect of weather on human health, for example. One way to get around this was to record as much detail as possible when making observations, so that patterns might begin to appear. So perhaps having the weather reports in a place where they were easily comparable with other happenings (such Hooke’s health, or the moon’s apogee) would be more useful than keeping separate tables. those steams, which seem to issue out of the Earth, and mix with the Air (and so precipitate some aqueous Exhalations, wherewith ’tis impregnated) . . .
something of this kind I am able to discover, by an Instrument I contriv’d to shew all the minute variations in the pressure of the Air; by which I constantly find, that before, and during the time of rainy weather, the pressure of the Air is less, and in dry weather, but especially when an Eastern Wind (which having past over vast tracts of Land is heavy with Earthy Particles) blows, it is much more, though these changes are varied according to very odd Laws. 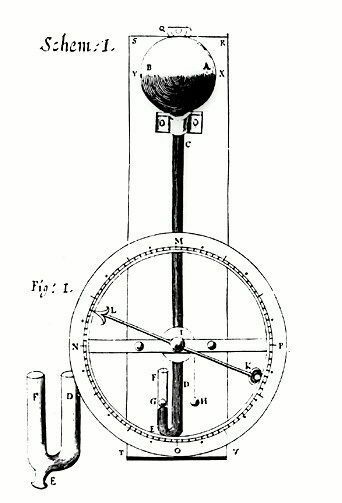 He published a drawing of his wheel barometer in Micrographia. The ‘J’ shaped glass tube is filled with mercury, and has a sealed bulb at the top but is open at the other end. In the bulb a vacuum provides enough suction to prevent the mercury from flowing out of the tube. At the open end of the tube a ball floats on the mercury. This float is attached to the pointer on the dial by a length of string. If the air pressure rises the mercury is forced up into the bulb and the level of the mercury at the open end drops. As the float drops too, the pointer moves. Hooke and his colleagues were setting the tools in place to enable predictions of rough weather on land and at sea. Unfortunately, we’re not able to interpret Hooke’s data because we don’t know enough about his instruments and scales – or at least, I believe that’s the case but if anyone out there knows differently please get in touch! This entry was posted in The Diary and tagged barometer, weather by felicityhen. Bookmark the permalink.